Bring warmth into your body and into your life by making this simple routine a daily practice. Surya (Sun) Namaskar or Namaskara (devotional greeting) is a sequence of Asana, strung together with the breath like beads on a thread. As a devotion to the Sun this sequence is great to warm the body and focus the mind. First take a look at the pictures below and allow your breath to move as you scan from one to the next according to the instruction for that pose. Go through it a few times in this way - just looking at the positions and setting the rhythm of your breath. 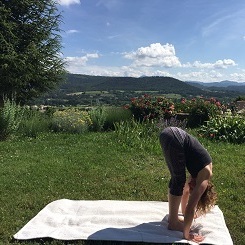 Set an intention for your practice: to do this you may think of a quality you would like more of in your life, for example: peace, courage, fluidity, connection; then repeat your intention several times in your head, or aloud: "I am courageous!" Let me know how you get on or if you have any of your own tips in the comments below.